Some of you may remember the old OCNotifier chrome extension that used to notify you when your favorite maps was being played on the Overcast Network. 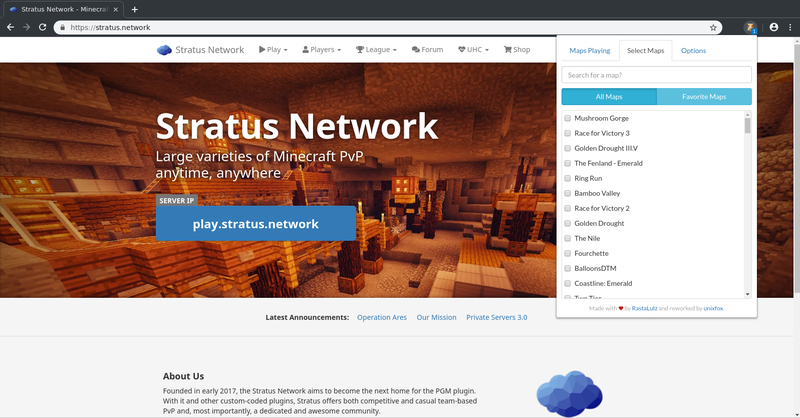 The extension no longer works BUT I revived it by making it compatible with the Stratus Network under the name StratusNotifier! How do I install it on my browser? I'm sorry Safari users or others browsers users the technology that I use it's not compatible with others browsers and would require a complete rework of the extension. I found a bug or a feature is missing, how do I report it? You can report it on my project's GitHub page: https://github.com/stratusnotifier/WebExtension/issues/new if you have a GitHub account, or reply to this post. How does the extension look like? Can I view the source code of this extension? Sure just like old OCNotifier extension the source code is also available here: https://github.com/stratusnotifier/WebExtension and if you want to check out the behind the extension (the backend) it's available too here: https://github.com/stratusnotifier/API. While you are at it I would appreciate if you click on the star button of the project's GitHub . I hope you will like the extension please don't forget to leave a feedback and rate it on the extension page (Chrome web store or Firefox Add-ons)! Wow! Keep working on this great content. 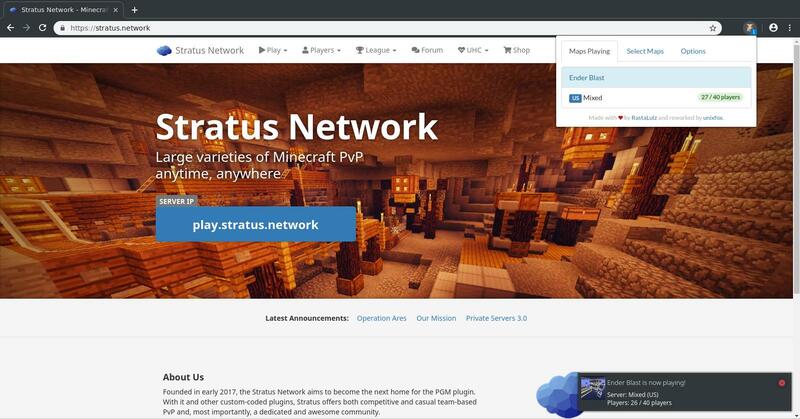 why unixfox isnt a stratus developer???????? @jmb6g What do you mean by that, if you are talking about displaying the maps of the current rot it's already available on my first project: Stratus Network Monitoring. But if you are talking about classifying maps on the "select maps" section of the extension it's a good idea, I'll add that to my idea box. @Eudaldca @auze @omniox @jmb6g @Pibo @aresitu Thank you all of you for your feedback . @Rau1 Thank you for your kind words, I appreciate your honesty. @Rockaror @neeq Haha you made me smile . Hey this is awesome, it's cool that you got this old tool working again. I can't quite remember how it worked back then, I seem to recall it pinged maps on the map page every x minutes? Does it still do that? Will the tool automatically update when a new map is added to the repo? I don't really know how the backend of the old OCNotifier worked because it isn't open source, I had to "reverse engineered" the behavior of the web extension to make the API of the StratusNotifier extension. And about how the extension know which map is playing, I parse the HTML of the play page every 10 seconds. I could get the current map playing on the server by connecting the extension to unixbot but I didn't want to add a big dependency on it because if my bot goes offline the web extension too. Small bug, but the notification that comes up says (at least on MacOS) "Players: 30/32 players" which is redundant. So you'll manually update the list every couple of weeks/months? I will try to remember to run the update script at every stratus status until I found the ideal solution (or if the official Operation Ares API comes before I found the solution ). I just pushed a fix for the extension because it was misbehaving by reporting multiple times in a row that the map was playing.